We recently identified CD8+CD122+ regulatory T cells that directly control CD8+ and CD4+ cells without intervention of APCs. In this study, we investigated the effector mechanism of CD8+CD122+ regulatory T cells by using an in vitro regulation system. The profile of cytokine expression revealed that IL-10 was predominantly produced by CD8+CD122+ cells, whereas other cytokines were similarly expressed in CD8+CD122+ cells and CD8+CD122− cells. Suppression of both proliferation and IFN-γ production by CD8+CD122− cells by CD8+CD122+ cells was blocked by adding anti-IL-10 Ab to the culture but not by adding anti-TGF-β Ab. When IL-10 was removed from the conditioned medium from CD8+CD122+ cells, the conditioned medium no longer showed regulatory activity. Finally, CD8+CD122+ cells from IL-10-deficient mice had no regulatory activity in vitro and reduced regulatory activity in vivo. Our results clearly indicate that IL-10 is produced by CD8+CD122+ cells and mediates the regulatory activity of these cells. Regulatory T cells are classified into two groups: naturally occurring regulatory T cells and induced regulatory T cells. Naturally occurring regulatory T cells are represented by CD4+CD25+ T cells (1, 2, 3, 4, 5). In the phase of effector function of CD4+CD25+ regulatory T cells, the involvement of certain suppressive cytokines, such as TGF-β and IL-10, has been suggested (6, 7, 8). However, regulatory activity irrelevant to IL-10 and TGF-β has also been reported, and the conclusive effector molecule in the action of CD4+CD25+ regulatory T cells is yet to be determined (9). We recently identified CD8+CD122+ as another naturally occurring regulatory T cells in mice (10). The CD8+CD122+ regulatory T cells are important in regulating other CD8+CD122− T cells, which become dangerously activated T cells that are harmful for self and kill the individual host without regulation from the CD8+CD122+ regulatory cells. Such strong activity of CD8+CD122+ regulatory T cells promises the application of these cells in the control of immune activity. A characteristic mechanism that distinguishes CD8+CD122+ regulatory T cells from CD4+CD25+ cells is that CD8+CD122+ cells directly control CD8+ and CD4+ T cells without intervention of APCs (10). The aim of the present study was to determine the molecular mechanism responsible for the suppressive activity of CD8+CD122+ regulatory T cells. The results showed that IL-10 is an important factor that mediates the suppressive activity of CD8+CD122+ regulatory T cells. Six- to 8-wk-old C57BL/6 (C57BL/6J) mice were purchased from SLC Japan. IL-10-deficient mice of C57BL/6 genetic background (B6.129P2-Il10tm1Cgn/J) were purchased from The Jackson Laboratory. RAG-2-deficient mice of C57BL/6 genetic background (B6.129S6-Rag2tm1FwaN12) were obtained from Taconic Farms and maintained in our animal facility. Fluorescence-conjugated Abs were purchased from eBioscience. Neutralizing Abs were purchased from R&D Systems. Spleen cells were incubated with anti-CD8-coated magnetic beads (Miltenyi Biotec) and were subjected to the magnetic separation column for positive selection. CD8+-enriched cells were stained with anti-CD8 and anti-CD122 Ab, and CD8+CD122+ cells and CD8+CD122− cells were isolated by using FACSVantage cell sorter (BD Biosciences). Isolated cells were cultured under stimulation with plate-bound anti-CD3 for 48 h. The cultured medium was harvested and kept frozen at −80°C until use. CD8+CD122− cells were labeled with CFSE (Molecular Probes) and were cultured in anti-CD3-coated 96-well culture plate (5 × 105 cells/well). Unlabeled CD8+CD122+ cells were added in a predetermined ratio to the labeled cells. After 48 h of culture, CFSE content was analyzed by using FACSCalibur flow cytometer (BD Biosciences). For intracellular cytokine staining, cells were treated with Cytofix/Cytoperm (BD Pharmingen) and then stained with biotin-conjugated anti-IFN-γ or anti-IL-10 Ab. cDNA was synthesized using the SuperScript first-strand synthesis system for RT-PCR (Invitrogen Life Technologies). IL-10 and hypoxanthine phosphoribosyl transferase (HPRT)3 mRNA levels were quantified by real-time PCR using the ABI/PRISM 7700 sequence detection system (Applied Biosystems). Analyses were performed using primers, an internal fluorescent TaqMan probe specific to IL-10 or HPRT, and the TaqMan Universal PCR Master Mix (Applied Biosystems). Conditioned medium were incubated with 20 μg/ml anti-IL-10 or anti-TGF-β Ab (R&D Systems), or 70 μg/ml goat anti-mouse Ig Ab (Invitrogen Life Technologies) by gentle mixing for 2 h. Protein G (ImmunoPure) was added to the Ag-Ab complex (50 μl of gel per 10 μg of Ab), and samples were incubated with gentle mixing overnight at 4°C. Immobilized protein G-bound complexes were removed from the conditioned medium by ultracentrifugation at 10,000 rpm for 1 min. We prepared conditioned medium from the culture of CD8+CD122+ regulatory T cells (CM122+) or that from control CD8+CD122− cells (CM122−) stimulated by plate-bound anti-CD3 Ab. When purified CD8+CD122− cells were labeled with CFSE and then cultured under stimulation with plate-bound anti-CD3, they proliferated and showed the characteristic pattern of reduced CFSE-fluorescence (Fig. 1⇓A, top left panel). This proliferation pattern disappeared when these CD8+CD122− cells were cocultured with CD8+CD122+ cells (Fig. 1⇓A, top right panel). This suppression of proliferation was also observed when CD8+CD122− T cells were cultured in a medium containing 50% of CM122+ but not in a medium containing 50% of CM122− (Fig. 1⇓A, bottom panels, and Fig. 1⇓B). 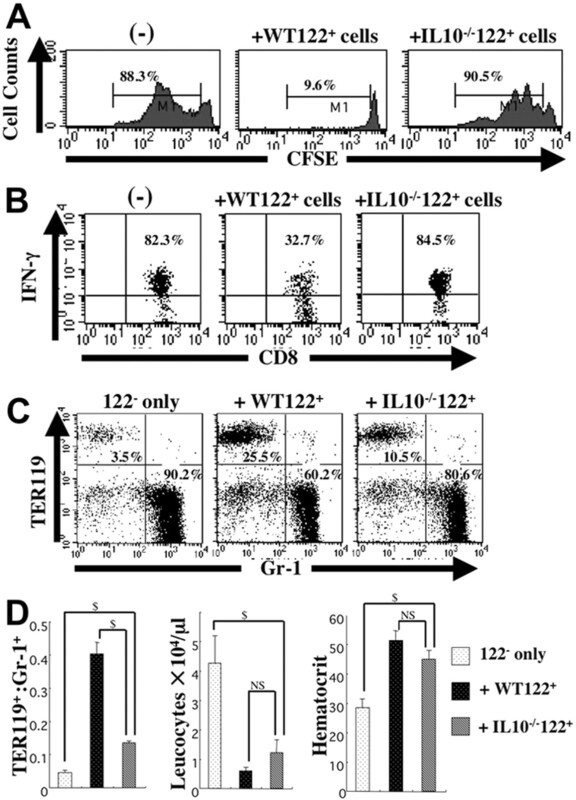 Furthermore, the production of IFN-γ from CD8+CD122− cells was suppressed when these cells were cocultured with CD8+CD122+ regulatory T cells (Fig. 1⇓C, top panels). This suppression of IFN-γ expression was also noted in CD8+CD122− indicator T cells cultured in conditioned medium derived from the culture of CD8+CD122+ regulatory T cells (CM122+; Fig. 1⇓, C and D). These results indicated that the suppressive activity of CD8+CD122+ regulatory T cells on cell proliferation and IFN-γ production was solely mediated by certain medium-soluble factor(s). Suppressive activity of CD8+CD122+ T cells is transduced by medium-soluble factor(s). A, CD8+CD122− T cells isolated from C57BL/6 mice were labeled with CFSE and cultured under stimulation with plate-bound anti-CD3 Ab. CD8+CD122− T cells were either cultured alone (−), cocultured with one-fourth number of CD8+CD122+ T cells (+122+ cells), cultured in a medium containing 50% of conditioned medium obtained from the culture of CD8+CD122− cells (CM122−), or cultured in a medium containing 50% of conditioned medium obtained from the culture of CD8+CD122+ cells (CM122+). After 48 h of culture, CFSE fluorescence intensity was measured by flow cytometry. The percentage of proliferated cells with reduced CFSE-fluorescence is shown in each panel. B, Percentages of proliferated cells in CFSE-labeled cells based on counting cells with reduced CFSE fluorescence. Data are mean ± SD of triplicate experiments. C, CD8+CD122− T cells were cultured as in A, stained with anti-CD8 Ab, and then subjected to intracellular staining for IFN-γ. The percentage of cells expressing IFN-γ in total CD8+ cells is shown in each panel. D, Quantitative data of the percentages of IFN-γ-expressing cells as analyzed by intracellular staining. Data are mean ± SD of triplicate experiments. 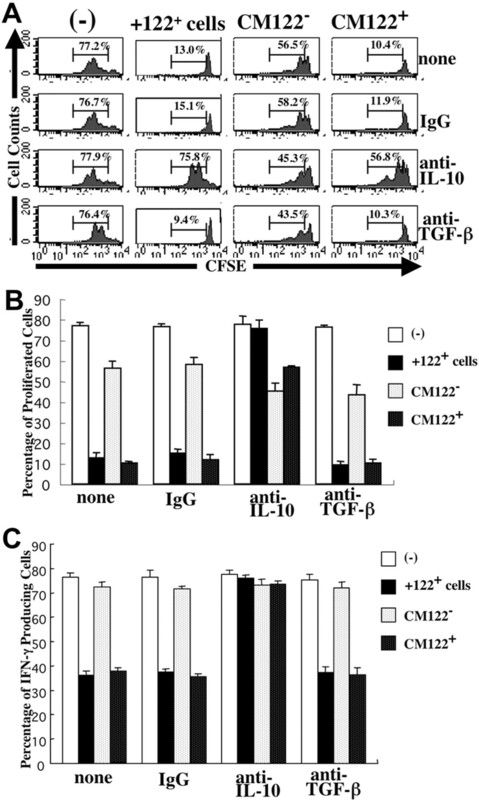 Candidate medium-soluble factors that mediate the suppressive activity of regulatory T cells are suppressive cytokines like IL-10 and TGF-β (11, 12). RT-PCR analysis revealed that anti-CD-3-stimulated CD8+CD122+ cells and CD8+CD122− cells expressed similar levels of various cytokines (IFN-γ, IL-4, TGF-β, TNF-α, and lymphotoxin-α) but not IL-10, which was detectable in CD8+CD122+ cells but not in CD8+CD122− cells (Fig. 2⇓A). Real-time RT-PCR analysis of IL-10 clearly showed that the expression level of IL-10 in CD8+CD122+ cells was >8 times higher than that in CD8+CD122− cells (Fig. 2⇓B). Production of IL-10 from CD8+CD122+ cells was also confirmed in intracellular protein (Fig. 2⇓C) and in culture supernatant (Fig. 2⇓D). CD8+CD122+ T cells express IL-10. A, CD8+CD122+ T cells (+) and CD8+CD122− T cells (−) were isolated from C57BL/6 mice and cultured under stimulation with plate-bound anti-CD3 for 48 h. RNA was extracted to analyze the expression of various cytokines by RT-PCR. Specific amplification of IL-10 was confirmed by Southern hybridization (middle panel). B, Real-time PCR analysis was performed to quantify the expression level of IL-10. Data are mean ± SD of triplicate experiments. C, Intracellular cytokine staining was performed to examine production of IL-10. Percentage of cells expressing detectable level of intracellular IL-10 is shown in each panel. D, The amounts of IL-10 in culture supernatants were measured by ELISA. Data are mean ± SD of triplicate experiments. Next, anti-IL-10 Ab was added to the coculture of CD8+CD122+ regulatory T cells and CD8+CD122− indicator T cells. As shown in Fig. 3⇓A, the addition of anti-IL-10 Ab to the culture rescued the proliferation of CD8+CD122− indicator T cells. This result indicates that neutralization of IL-10 restored the proliferation, which was suppressed in cocultures with CD8+CD122+ regulatory T cells. In contrast to the action of anti-IL-10 Ab, anti-TGF-β Ab had no effect on the CD8+CD122+-induced suppression of CD8+CD122− proliferation. The results of CD8+CD122+-CD8+CD122− cell cocultures were almost identical with those of experiments using conditioned medium obtained from the culture of anti-CD3-stimulated CD8+CD122+ regulatory T cells, confirming the effects of anti-IL-10 Ab (Fig. 3⇓A, right side panels, and Fig. 3⇓B). Expression of IFN-γ in CD8+CD122− cells, which was suppressed by coculture with CD8+CD122+ regulatory cells, was also restored in cultures with neutralizing anti-IL-10 Ab but not in culture with anti-TGF-β Ab (Fig. 3⇓C). These results indicate that IL-10 mediates the suppressive effect of CD8+CD122+ regulatory cells. Regulatory activity of CD8+CD122+ T cells and conditioned medium is blocked by anti-IL-10 Ab but not by anti-TGFβ Ab. A, CD8+CD122− T cells were labeled with CFSE and cultured under stimulation with plate-bound anti-CD3 Ab for 48 h. CD8+CD122− T cells were either cultured alone (−), cocultured with one-fourth number of CD8+CD122+ T cells (+122+ cells), cultured in 50% conditioned medium obtained from the culture of CD8+CD122− cells (CM122−), or cultured in 50% conditioned medium obtained from the culture of CD8+CD122+ cells (CM122+). Cells were cultured in a medium without the addition of Ab (none), with anti-IL-10 Ab, with anti-TGF-β, or with rat isotype-control IgG (IgG). Percentage of proliferated cells with reduced CFSE-fluorescence is shown in each panel. B, Percentages of proliferated cells in CFSE-labeled cells based on counting cells with reduced CFSE fluorescence. Data are mean ± SD of triplicate experiments. C, CD8+CD122− T cells were cultured as in A and were subjected to intracellular staining for IFN-γ. Quantitative data of the percentages of IFN-γ-expressing cells. Data are mean ± SD of triplicate experiments. We treated the conditioned medium from CD8+CD122+ regulatory T cells with anti-IL-10 Ab to absorb IL-10 from the conditioned medium. 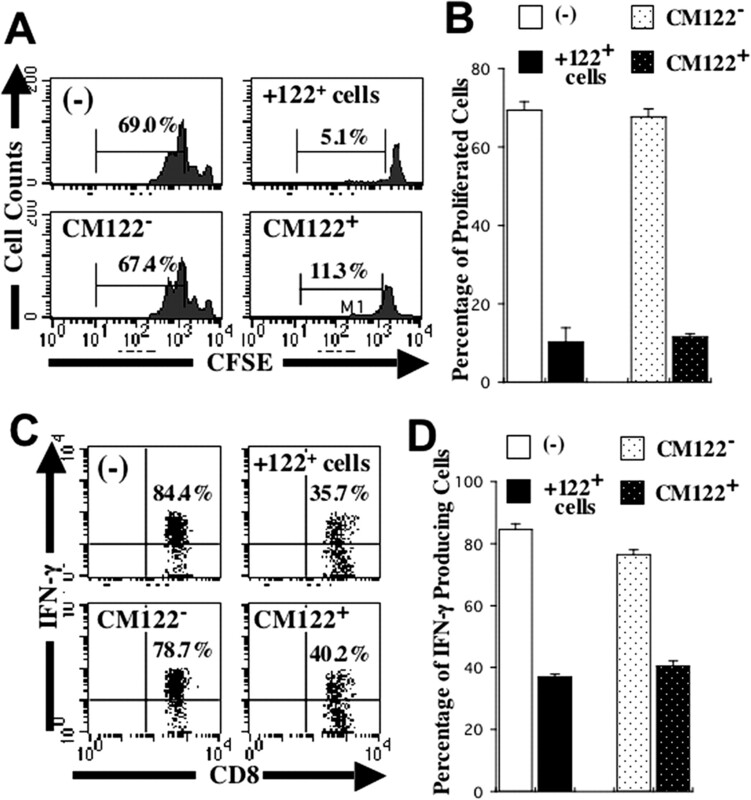 Such IL-10-absorbed conditioned medium did not suppress the proliferation of CD8+CD122− cells (Fig. 4⇓, A and B) or the production of IFN-γ from CD8+CD122− cells (Fig. 4⇓C). In contrast, TGF-β-absorbed conditioned medium still suppressed cell proliferation and IFN-γ production (Fig. 4⇓). These results excluded the possibility of direct effect of anti-IL-10 Ab on CD8+CD122− indicator cells, and further confirmed the importance of IL-10 as a suppressive effector in CD8+CD122+ cells. IL-10-absorbed conditioned medium from CD8+CD122+ cells shows no suppressive activity. A, Conditioned medium obtained from the culture of CD8+CD122− cells (CM122−) and conditioned medium obtained from the culture of CD8+CD122+ cells (CM122+) were untreated (none) or treated with anti-IL-10 Ab (-IL-10), anti-TGF-β Ab (-TGF-β), or control Ab (IgG) to absorb the desired factor from the conditioned medium. CD8+CD122− T cells were cultured in such factor-absorbed conditioned medium, and their proliferation was measured by CFSE-fluorescence decrease. The percentage of proliferated cells with reduced CFSE fluorescence is shown in each panel. B, Percentages of proliferated cells in CFSE-labeled cells based on counting cells with reduced CFSE fluorescence. C, CD8+CD122− T cells were cultured in the factor-absorbed conditioned medium and were subjected to intracellular staining for IFN-γ. Quantitative data of the percentages of IFN-γ-expressing cells as analyzed by intracellular staining. Data are mean ± SD of triplicate experiments. Finally, we examined the suppressive activity of CD8+CD122+ cells obtained from IL-10-deficient mice. As shown in Fig. 5⇓, A and B, IL-10-deficient CD8+CD122+ cells did not suppress the proliferation of CD8+CD122− indicator cells or IFN-γ production by the indicator cells in the in vitro experiment. We also performed in vivo experiment of transferring mixtures of CD8+CD122− cells and IL-10-deficient mice-derived CD8+CD122+ cells into RAG-deficient mice. First, we evaluated the regulatory activity of CD8+CD122+ cells by normalization of the ratio of erythroid:myeloid cells in the bone marrow of RAG-deficient mice that had received CD8+CD122− cells mixed with the regulatory cells to be tested because we had observed that the hemopoiesis in the bone marrow of RAG-deficient mice with uncontrolled CD8+ cells in the absence of CD8+CD122+ regulatory cells skewed toward myeloid cell lineage (Ref.10 and Fig. 5⇓C, left panel). When RAG-deficient mice received wild-type mice-derived CD8+CD122− cells mixed with IL-10-deficient mice-derived CD8+CD122+ cells, the ratio of erythroid:myeloid cells in the bone marrow was not normalized as equally as that in mice that received CD8+CD122− cells mixed with wild-type mice-derived CD8+CD122+ cells, whereas it was obviously better than that in mice that received CD8+CD122− cells alone (Fig. 5⇓C). Because simple transfer of IL-10-deficient CD8+CD122+ cells alone did not cause hemopoietic abnormality (data not shown), this result indicated that IL-10 definitely contributed to the regulatory activity of CD8+CD122+ cells in vivo but that IL-10-deficient CD8+ CD122+ cells still possessed a considerable level of regulatory activity. We further analyzed the number of leukocytes and hematocrit values in peripheral blood of these mice and found that leukocyte numbers were not significantly increased, and the hematocrit values were not significantly decreased in mice that received CD8+CD122− cells mixed with IL-10-deficient CD8+CD122+ cells, compared with those in mice that received CD8+CD122− cells mixed with wild-type CD8+CD122+ cells (Fig. 5⇓D). As a result of hemopoietic disorders, RAG-deficient mice that received CD8+CD122− cells alone die within 10 wk after cell transfer (10), whereas none (0/3) of the mice that had received CD8+CD122− cells mixed with IL-10-deficient CD8+CD122+ cells died within 15 wk after cell transfer (data not shown). These results in the in vivo experiment suggested that the IL-10 deficiency in CD8+CD122+ regulatory cells caused changes in the bone marrow, which were not crucial to affect the status in peripheral blood and the general condition of mice. 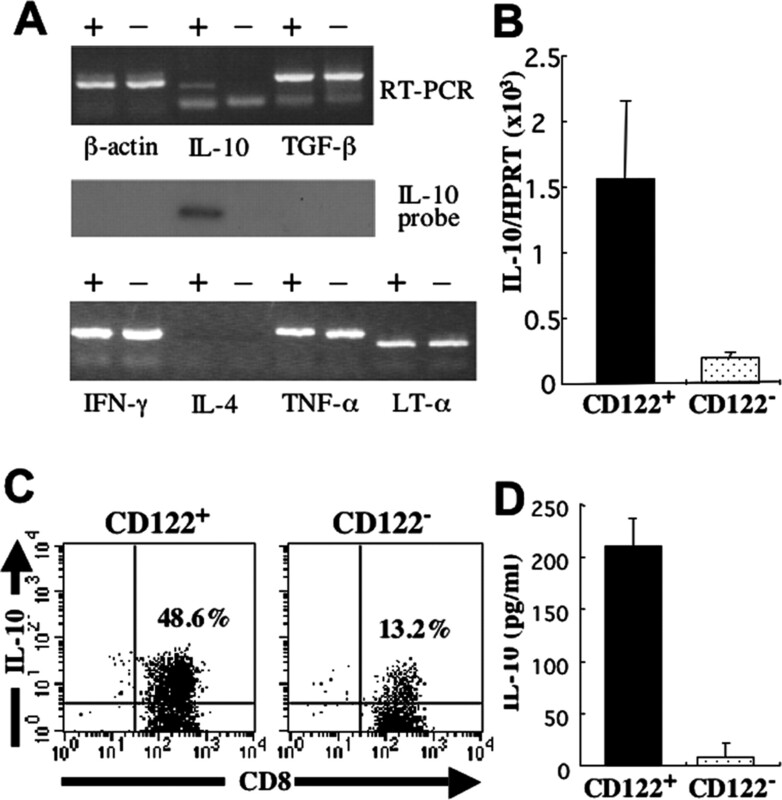 IL-10-deficient T cells show impaired regulatory activity for CD8+CD122− T cells. A, CD8+CD122− T cells were either cultured alone (−), cocultured with one-fourth number of CD8+CD122+ T cells obtained from wild-type C57BL/6 mice (+WT122+ cells), or cocultured with one-fourth number of CD8+CD122+ T cells obtained from IL-10-deficient mice (+IL-10−/−122+ cells) for 48 h. The percentage of proliferated cells with reduced CFSE fluorescence is shown in each panel. B, CD8+CD122− T cells were cultured as in A and were subjected to intracellular staining for IFN-γ. The percentage of IFN-γ-expressing cells among total CD8+ cells is shown in each panel. C, A total of 4 × 105 CD8+CD122− T cells obtained from wild-type C57BL/6 mice was mixed or unmixed with 1 × 105 of CD8+CD122+ T cells obtained from either IL-10-deficient mice or wild-type C57BL/6 mice, and were transferred into RAG-deficient mice. Seven weeks later, the bone marrow cells were analyzed for their distribution of erythroid-lineage cells expressing TER119 and myeloid-lineage cells expressing Gr-1. The percentage of erythroid-lineage cells and myeloid-lineage cells is shown in each panel. D, RAG-deficient mice that had received CD8+CD122− T cells mixed or unmixed with wild-type mice-derived or IL-10-deficient mice-derived CD8+CD122+ cells were analyzed at 7 wk after cell transfer: left, ratios of TER119+ erythroid-lineage cells against Gr-1+ myeloid-lineage cells in the bone marrow were calculated from the data obtained as in C; center, numbers of leukocytes in peripheral blood were counted using cell-counting chamber; right, hematocrit values were measured as described (10 ). In all three analyses, data are mean ± SD obtained from three mice in each group. $, Significantly different (p < 0.01, Student’s t test). Difference is NS (p > 0.1, Student’s t test). Regulatory T cells can be classified into two groups. One group involves naturally occurring type regulatory T cells represented by CD4+CD25+ and CD8+CD122+ regulatory T cells (1, 2, 3, 4, 5, 10). The other group comprises regulatory T cells that are induced by conventional T cells after antigenic stimulation. This group includes Th3 cells and Tr1 cells. The effector molecules mediating the action of regulatory T cells have been investigated, and there is general agreement that two cytokines are mainly responsible: IL-10 and TGF-β. In general, the effector molecules mediating the action of induced-type regulatory cells have been well characterized, i.e., IL-10 for Tr1 cells (13, 14) and TGF-β for Th3 cells (15). In the case of naturally occurring CD4+CD25+ regulatory T cells, the responsible effector molecule is controversial. Takahashi et al. (9) reported that neither anti-IL-10 nor anti-TGF-β Ab could abrogate the suppressive action of CD4+CD25+ T cells. The suppressive activity of CD4+CD25+ regulatory T cells is cell-contact dependent and mediated by cell surface molecules including CTLA-4 (16). In contrast, some investigators have reported that IL-10 (7, 8, 17) and TGF-β (6) are crucial for the suppressive effect of CD4+CD25+ regulatory T cells. In this study, we clearly showed that IL-10 is critically involved in the action of CD8+CD122+ regulatory T cells: another important subset of naturally occurring regulatory T cells (10). Our result of blocking the regulatory activity of CD8+CD122+ T cells by anti-IL-10 Ab in in vitro assay indicates that IL-10 is the indispensable factor produced from CD8+CD122+ regulatory T cells that suppresses the proliferation and IFN-γ production of CD8+CD122− cells. IL-10 mainly functions as antagonistic to Th1 cytokines (18, 19, 20). Because the activity of CD8+ T cells is mainly supported by Th1 cytokines including IFN-γ and IL-2, it is quite reasonable that IL-10 acts as an essential effector cytokine for CD8+CD122+ regulatory T cells that strongly suppress the activity of CD8+ T cells (10). Although we clearly showed that IL-10 is the essential functional factor produced by CD8+CD122+ cells in in vitro culture system, the indispensable role of IL-10 may only be observed in a limited culture time and in simple system with highly purified cells of limited population. The overall function of IL-10 in in vivo needs more careful interpretation because IL-10-deficient CD8+CD122+ cells showed a considerable regulatory effect on wild-type CD8+CD122− cells when they were cotransferred into RAG-deficient mice. The discrepancy between in vitro assay and in vivo results may be explained by the action of other regulatory mechanisms that compensate for the lack of IL-10. During the course of in vivo experiments, which take a longer time than in vitro assays, not only CD8+ cells but many different types of cells (e.g. CD4+ cells, NK cells, macrophages, etc.) are also involved. Because of such complexity in in vivo experiments, deficiency of IL-10 does not reflect the total functional defect of CD8+CD122+ regulatory cells. This phenomenon may correspond to the fact that IL-10-deficient mice do not show severe lethal immune disorders as CD122-deficient mice in which CD8+CD122+ regulatory T cells are completely absent (21). Further studies may be needed to identify those factors that compensate for the action of IL-10 in IL-10-deficient states in vivo. We thank H. Shiku for helpful discussions and Y. Lee for technical help. ↵1 This work was supported by Grants-in-Aid for Scientific Research from the Ministry of Education, Culture, Sports, Science and Technology of Japan. ↵3 Abbreviation used in this paper: HPRT, hypoxanthine phosphoribosyl transferase. Sakaguchi, S., N. Sakaguchi, M. Asano, M. Itoh, M. Toda. 1995. Immunologic self-tolerance maintained by activated T cells expressing IL-2 receptor α-chains (CD25): breakdown of a single mechanism of self-tolerance causes various autoimmune diseases. J. Immunol. 155: 1151-1164. Sakaguchi, S.. 2004. Naturally arising CD4+ regulatory T cells for immunologic self-tolerance and negative control of immune responses. Annu. Rev. Immunol. 22: 531-562. Shevach, E. M.. 2000. Regulatory T cells in autoimmunity. Annu. Rev. Immunol. 18: 423-449. Nakamura, K., A. Kitani, W. Strober. 2001. Cell contact-dependent immunosuppression by CD4+CD25+ regulatory T cells is mediated by cell surface-bound transforming growth factor β. J. Exp. Med. 194: 629-644. Pontoux, C., A. Banz, M. Papiernik. 2002. Natural CD4+CD25+ regulatory T cells control the burst of superantigen-induced cytokine production: the role of IL-10. Int. Immunol. 14: 233-239. Annacker, O., R. Pimenta-Araujo, O. Burlen-Defranoux, T. C. Barbosa, A. Cumano, A. Bandeira. 2001. CD25+CD4+ T cells regulate the expansion of peripheral CD4 T cells through the production of IL-10. J. Immunol. 166: 3008-3018. Takahashi, T., Y. Kuniyasu, M. Toda, N. Sakaguchi, M. Itoh, M. Iwata, J. Shimizu, S. Sakaguchi. 1998. Immunologic self-tolerance maintained by CD25+CD4+ naturally anergic and suppressive T cells: induction of autoimmune disease by breaking their anergic/suppressive state. Int. Immunol. 10: 1969-1980. Rifa’i, M., Y. Kawamoto, I. Nakashima, H. Suzuki. 2004. Essential roles of CD8+CD122+ regulatory T cells in the maintenance of T cell homeostasis. J. Exp. Med. 200: 1123-1134. Horwitz, D. A., S. G. Zheng, J. D. Gray. 2003. The role of the combination of IL-2 and TGF-β or IL-10 in the generation and function of CD4+CD25+ and CD8+ regulatory T cell subsets. J. Leukocyte Biol. 74: 471-478. Levings, M. K., R. Bacchetta, U. Schulz, M. G. Roncarolo. 2002. The role of IL-10 and TGF-β in the differentiation and effector function of T regulatory cells. Int. Arch. Allergy Immunol. 129: 263-276. Hara, M., C. I. Kingsley, M. Niimi, S. Read, S. E. Turvey, A. R. Bushell, P. J. Morris, F. Powrie, K. J. Wood. 2001. IL-10 is required for regulatory T cells to mediate tolerance to alloantigens in vivo. J. Immunol. 166: 3789-3796. Roncarolo, M. G., R. Bacchetta, C. Bordignon, S. Narula, M. K. Levings. 2001. Type 1 T regulatory cells. Immunol. Rev. 182: 68-79. Weiner, H. L.. 2001. Induction and mechanism of action of transforming growth factor-β-secreting Th3 regulatory cells. Immunol. Rev. 182: 207-214. Itoh, M., T. Takahashi, N. Sakaguchi, Y. Kuniyasu, J. Shimizu, F. Otsuka, S. Sakaguchi. 1999. Thymus and autoimmunity: production of CD25+CD4+ naturally anergic and suppressive T cells as a key function of the thymus in maintaining immunologic self-tolerance. J. Immunol. 162: 5317-5326. O’Garra, A., P. L. Vieira, P. Vieira, A. E. Goldfeld. 2004. IL-10-producing and naturally occurring CD4+ Tregs: limiting collateral damage. J. Clin. Invest. 114: 1372-1378. Mosmann, T. R., K. W. Moore. 1991. The role of IL-10 in crossregulation of TH1 and TH2 responses. Immunol. Today 12: 49-53. Moore, K. W., A. O’Garra, R. de Waal Malefyt, P. Vieira, T. R. Mosmann. 1993. Interleukin-10. Annu. Rev. Immunol. 11: 165-190. Fiorentino, D. F., A. Zlotnik, P. Vieira, T. R. Mosmann, M. Howard, K. W. Moore, A. O’Garra. 1991. IL-10 acts on the antigen-presenting cell to inhibit cytokine production by Th1 cells. J. Immunol. 146: 3444-3451. Kuhn, R., J. Lohler, D. Rennick, K. Rajewsky, W. Muller. 1993. Interleukin-10-deficient mice develop chronic enterocolitis. Cell 75: 263-274.